Ton of progress this week. To start things off, I ended up having to replace two more ribs. 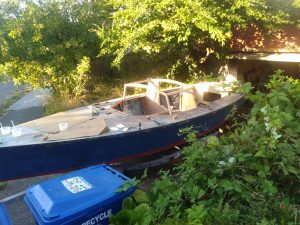 thought I had been done with that, but the more I moved about in the boat the more it became apparent two more of the midships ribs were not up to snuff. So a step back, but I knocked them out and moved past that. Continuing on, I started with the aft cabin bulkhead. there’s a lot going on in this picture. Beneath the side decks, you can see the pieces I put in to tie the cabin supports into the frames and give the plywood something to tie into. The white squares are pieces of HDPE i had from a previous project; I’ve been cutting stir sticks from them, and cutting these squares. Clamping a square on each side of the pieces like this holds the pieces fair and aligned while the glue sets, and when it hardens, the plastic pieces just pop off. 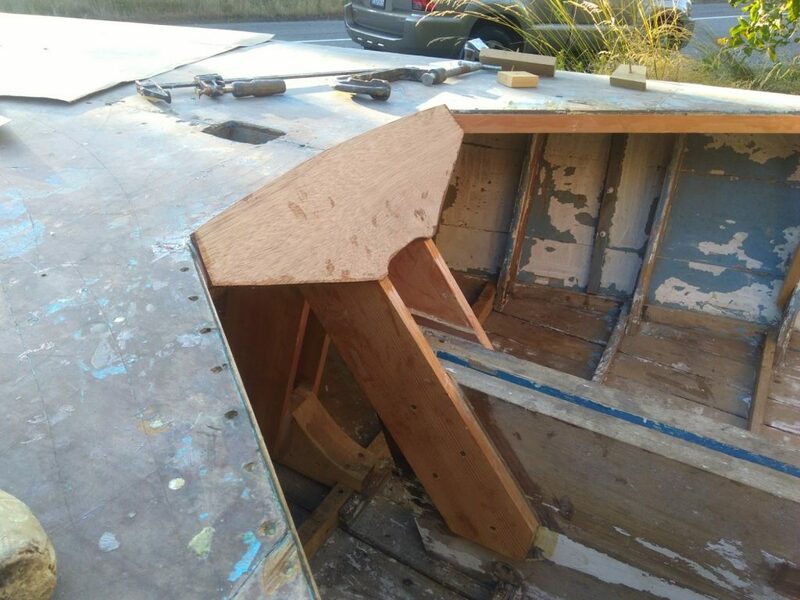 Beyond that, you can see the general layout of the bracing to support the centerboard trunk and what the companionway opening will look like. 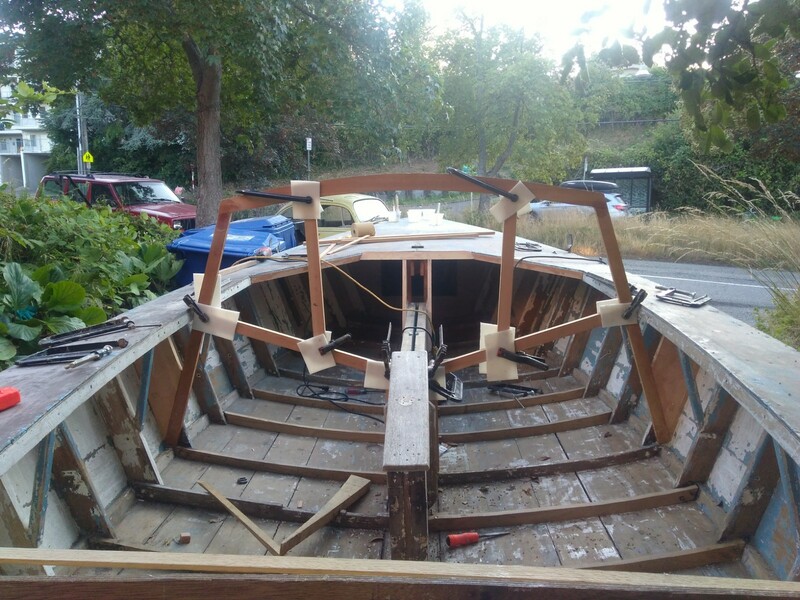 Up front, the last of the mast step / trunk / deck tie in is in. this piece has a curve to it because it is where the curved piece of plywood will go that will tie into the forward cabin top beam will be bonded to. Here’s a shot of the forward cabin beam framing. and then these two were tied together with the side pieces, cut to match the angle of the top and sides. i’ve also clipped in the aft bulkhead plywood, although I didn’t get that glued in place- it’s just dry fit. 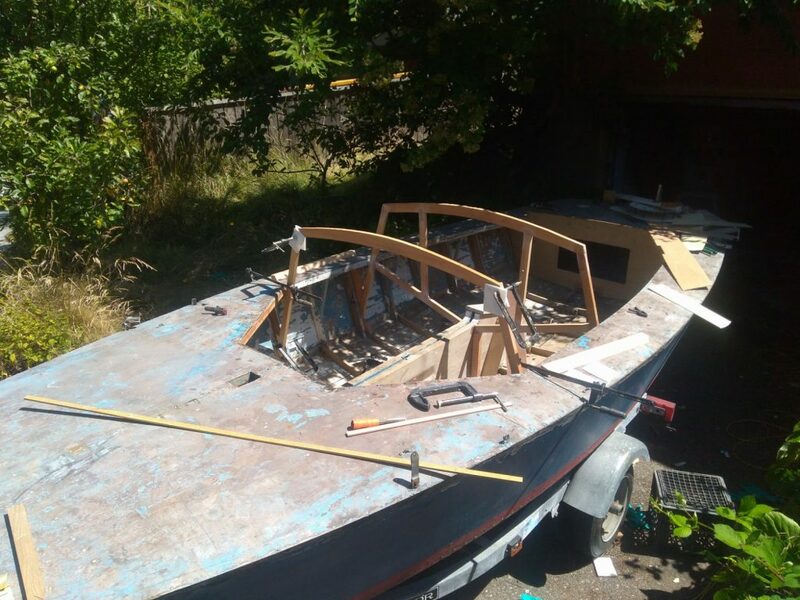 these two pieces on the sides i had made as one piece per side, however I ended up having to put a seam in because there was no way to install them hole; So the pieces under the side decks had to be cut off and installed as separate pieces with a seam along the diagonal cabin side beams. I did manage to get those two small pieces installed along with two backups for the aft deck organizers and the backup for the cockpit bilge pump outlet under the side decks; however I didn’t dare try and install the two large cabin bulkhead pieces. it was 90 degrees this weekend and all I had was fast hardener for my epoxy. by the heat of the day i was down to refrigerating the pieces of wood before i mixed the epoxy. It was really, really easy to get a 2-squirt batch to go exothermic on me today. In other news, I may be out for the Barefoot raid. there’s just so much that needs to be done on the boat, and I realistically don’t know if I’ll have the time or the money to finish it in time. Super bummed about that. Yeah, I really want to make the raid, but this is a ton of work. 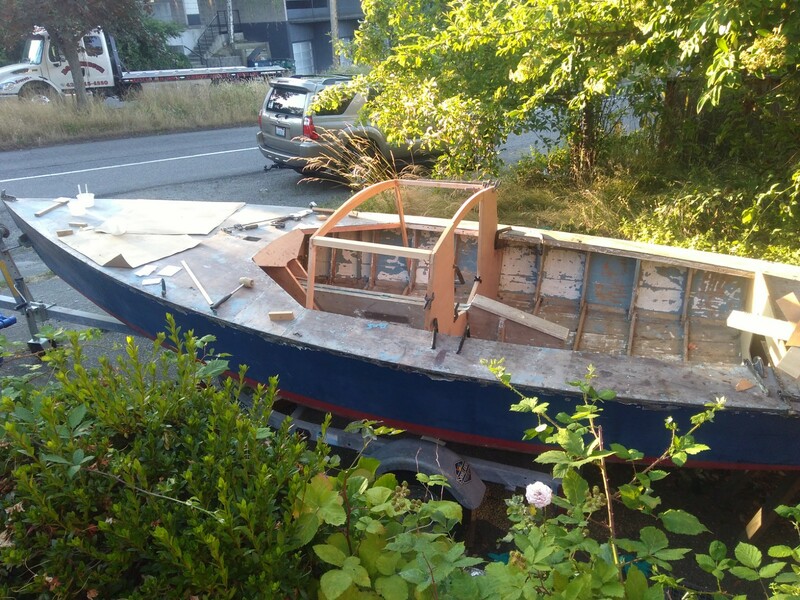 I hope to have many adventures in this boat.